The strong fishing coming in off the latest frontal system has waned and we are finding ourselves hard pressed to draw strikes from good game fish. There are some large Sharks well off the edge but most everything else is proving difficult. A lot of time spent the last couple of days off the edge of the reef did yield sharks of all sizes and a really good opportunity at an exceptional Wahoo that took a small live Bullett Bonito that had an unhappy ending (for us) as the fish turned sharply after a long strong run as Wahoo often do, and doubled back into to line, biting us off. Not at all a common occurrence, but it does happen. Lucky Wahoo for sure. 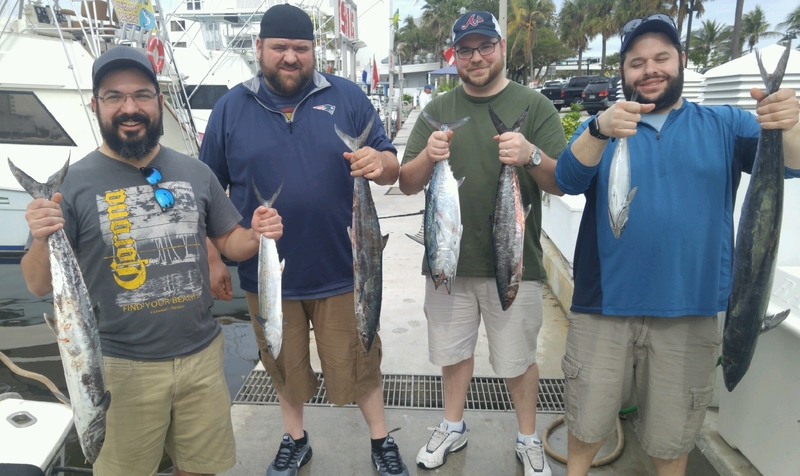 A couple of Sailfish bites resulted in one fish pulling off just behind the boat and outside the leader, the second opportunity at one had the fish quickly throwing the hook. 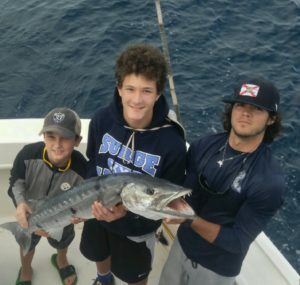 We have chosen to hammer away at the reef now and we have caught some Kingfish, Bonito and Barracudas. 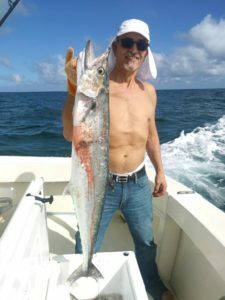 But we have also spent some time again pulling live Ballyhoo and mixed them in with those small live Bullett Bonito in an effort to draw bites from more potential species. 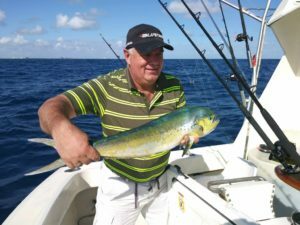 Only a couple of Mahi-Mahi and large Bonito have joined in there, with no Sailfish showing in the baits. Occasionally spotting a free jumping Sail moving south (as expected) but only a single fish caught by the fleet yesterday. The current is close to zero on the reefs. There was reasonable north current out in 400 feet but………..we’ll try door #3 tomorrow, and that will begin by starting out on the reefs on the troll where there is thankfully some activity. Forecasters and calling for it to reach 80 degrees the next couple of days with S/SE winds and then a small front rolling through will drop it to the lower 70s and then upper 60s for a high the second day as the front passes by. Reasonable wind is expected so we will be comfortable offshore.